NTPC is India’s largest energy conglomerate with roots planted way back in 1975 to accelerate power development in India. Since then it has established itself as the dominant power major with presence in the entire value chain of the power generation business. From fossil fuels it has forayed into generating electricity via hydro, nuclear and renewable energy sources. NTPC became a Maharatna company in May 2010, one of the only four companies to be awarded this status. NTPC was ranked 431st in the ‘2015, Forbes Global 2000’ ranking of the World’s biggest companies. Full time Bachelors Degree in Engineering/ Technology; AMIE with not less than 65% marks from recognized University/ Institute. Note: Final Year / Semester students are also eligible to apply. Eligible candidates will have to appear for Graduate Aptitude Test in Engineering (GATE) – 2019. Based on the GATE 2019 marks, candidates will be called shortlisted for Group Discussion & Personal Interview. Merit List of successful candidates will be drawn basis 85% weightage to GATE 2019 marks, 5% weightage for Group Discussion and 10% weightage for Personal Interview. Note: Only GATE 2019 Score is valid for this recruitment process. GATE score of 2018 or prior is not valid. All interested and eligible candidates apply for this position in online through GATE 2019 Examination latest by 1st October 2018. 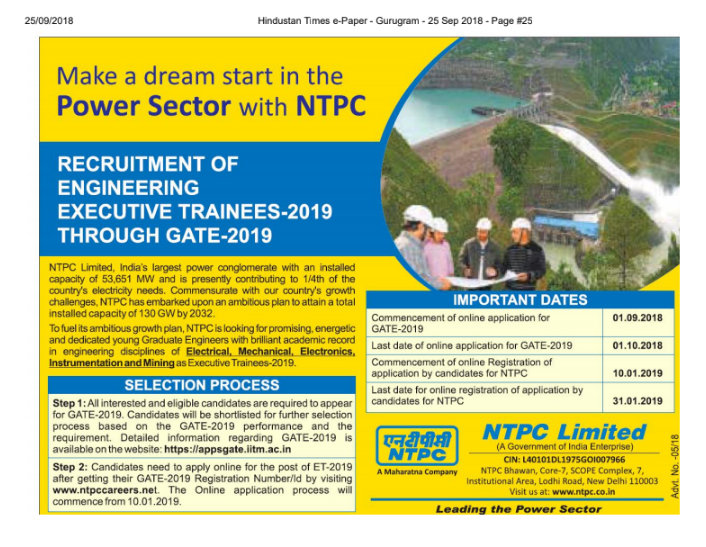 Eligible candidates apply ET vacancies in NTPC Career website from 10th January 2019 to 31st January 2019.